Lets you preview content of links without clicking. Is there a better alternative to Cooliris Previews? Is Cooliris Previews really the best app in Internet Utilities category? Will Cooliris Previews work good on macOS 10.13.4? Cooliris Previews is a free extension for the Safari browser that lets you preview the underlying content of links without even clicking. This way you'll browse faster and easier, and not lose the context of your search. Moreover, images can be previewed from Flickr and Google Images in full-size! Drag and drop the images into a presentation or document. An expanded list of Cooliris enabled sites, now including Yahoo!, Flickr, AOL, Ask and Newsvine! 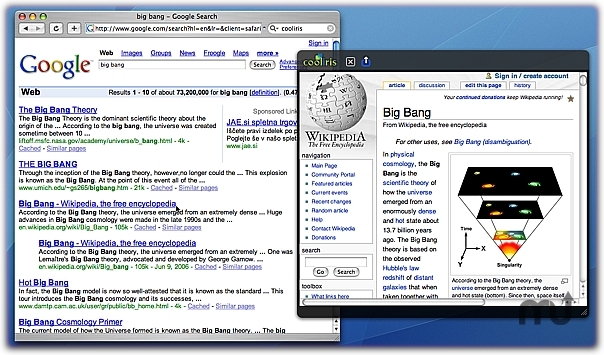 Cooliris Previews for Mac Beta 1.1 works on Google (Web, Images, News, Groups, Froogle), Yahoo!, AOL, Flickr, BBC News, CNN News, Craigslist, eBay, Del.icio.us, RSS feeds, and a growing list of sites. Installs/upgrades in about 10 seconds, and does not contain any adware or spyware whatsoever. Also available for Firefox and Internet Explorer browsers at http://www.cooliris.com.